Self-contained, 100% drop-in trigger is ready to install in your Ruger American rifle for an exceptionally smooth, crisp, trigger pull. Pull weight is factory set at crisp three pounds and you can set it yourself to any pull weight you'd like from 1.5 to 4 pounds. Lightweight 6061 T6 aluminum housing is anodized for extra durability. The trigger is CNC machined on the most cutting edge robotic machines available. The sear is EDM cut and Teflon-nickel coated for maximum lubricity. 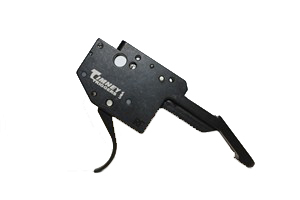 The whole unit has been designed for easy installation and manufactured using Timney's stringent specifications for a lifetime of trouble free service.The trigger has adjustments for sear engagement and pull weight. This was not a simple drop-in procedure as advertised. It required a gun smith due to interferance with the bolt. Not E Arthur Brown's fault though. Shame on Timney!